What is a healthy river system? You are here Home > Biodiversity > What is a healthy river system? We hear a lot about achieving a ‘healthy river system’ in the Murray–Darling Basin, but what actually is a healthy river system? What does a healthy Murray–Darling Basin look like? A healthy river system is one which supports all competing interests relying on its precious natural resource – water. One that supports the environment such as birds, fish and plants, as well as supporting productive industries and communities. River systems altered for human water use can still be healthy, as long as all the different needs get their fair share of water. the Basin is able to perform its ecosystem functions e.g. natural river processes are occurring, such as recycling nutrients and replenishing groundwater. As the Murray–Darling Basin struggled through the millennium drought, it became clear the overall health of the Basin was suffering. Over four million people depend on the Basin’s water for their everyday lives, multimillion dollar industries rely on the same water to remain productive, and a diverse range of plants and animals also rely on the wellbeing of river systems to survive. By improving the health of the Basin’s river systems, many benefits will be felt by individuals, communities and industries. A healthy environment will provide improved recreational benefits for local residents, tourists and businesses, as well as supporting water quality suitable for irrigation, domestic and urban water supplies. River users across the basin have a diverse range of interests and needs. 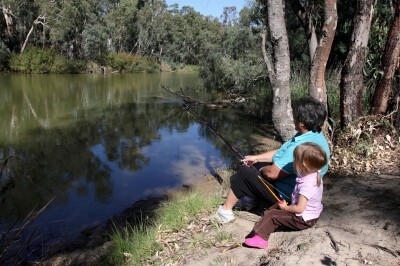 To achieve and maintain healthy river systems across the Basin, the Murray–Darling Basin Authority needs to find a balance between the water made available for community and industry use, and for environmental purposes. Finding this balance is being made easier by infrastructure developments, which allow individuals, industries and communities to use water more efficiently. The willingness of communities, industries and water management bodies to find ways to use water effectively shows just how important water is to everyone. Huge progress was made in increasing the health of the Basin’s river systems in 2014-15. There were up to 50% more breeding events for colonial nesting waterbird species, a 10-15% improvement in mature populations of Murray cod and golden perch at key sites, diverted 432,000 tonnes of salt away from the river, and invested in more efficient irrigation infrastructure through on-farm programs for individual irrigators and infrastructure operators. Further progress highlights and the Murray–Darling Basin Authority’s plans for continuing this progress into the future can be found in the Basin Plan annual report.